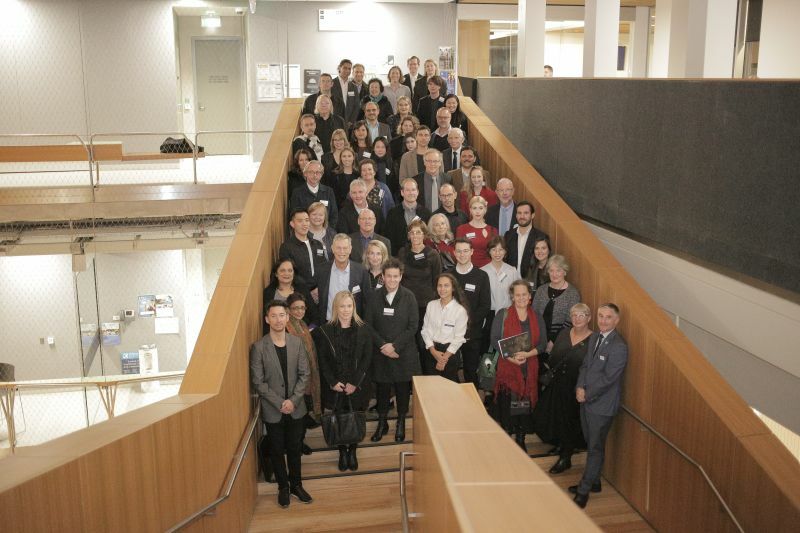 Award recipients, sponsors, guests and Melbourne School of Design staff. Photo:Jonathan Mackojc. The awards recognised academic merit across MSD’s graduate programs and included a number of special awards to celebrate excellence in particular areas of study and research. A series of prizes celebrated specific achievements, such as the DesignInc Positive Legacy of Design Award, for the best design from any discipline with potential to have positive social and ecological outcomes, and the inaugural Denton Corker Marshall Award, for excellence in design at the end of the first year in the Master of Architecture. 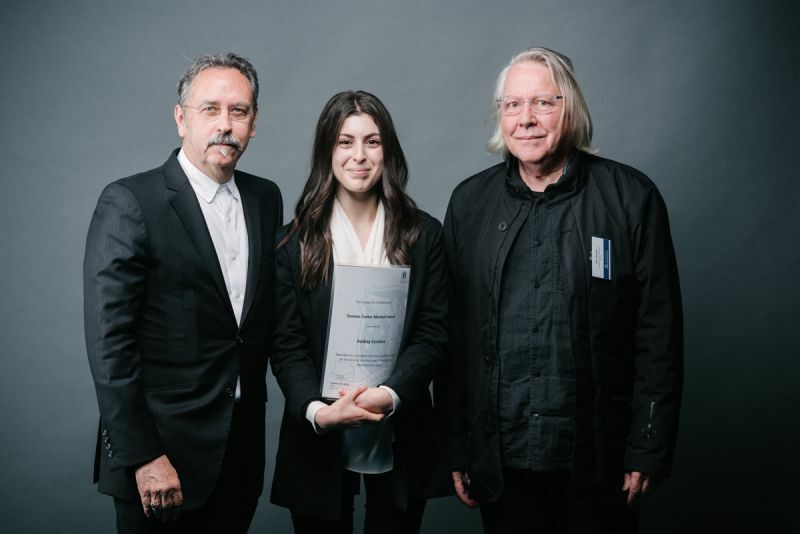 Denton Corker Marshall founding director and University of Melbourne alumnus John Denton presented the award to Audrey Cavalera. He said after many years in the industry, he felt it was important to support architecture students to achieve their goals and progress through their career. “Bill Corker, Barrie Marshall and I had our first day of architecture together here a long time ago. We’ve been able to succeed and I think if you can give others a chance to succeed, that’s really important,” Mr Denton said. Professor Donald Bates, Denton Corker Marshall award recipient Audrey Cavalera, John Denton. Photo: Paul Philipson. The architecture awards included the Macdonald Scholarship, which promotes advancement in the profession by offering students an opportunity, through travel, to pursue architectural research and gain professional experience. Another highlight of the ceremony was the awarding of the SJB Scholarship, which supports outstanding students in the Master of Architecture. 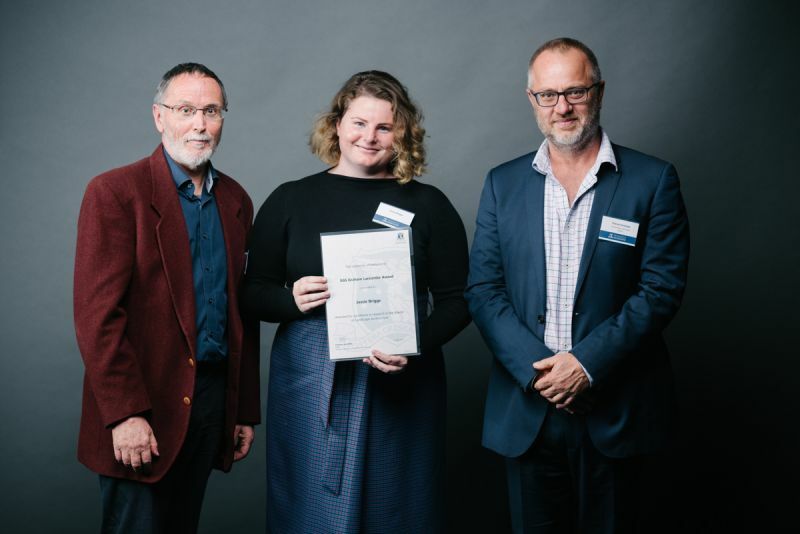 In the urban planning discipline, the SGS Graham Larcombe Award recognised a demonstrated interest in equity and social disadvantage issues in urban development. This year’s recipient, Jessie Briggs, said she felt privileged and encouraged to continue pursuing her interests. “I’m in the middle of my studies, so it’s been a lovely validation of the path I’m going down,” she said. SGS Economics & Planning principal and partner Patrick Fensham presented the award. He said it was a chance to support the profession and encourage students who showed an interest in areas such as equality and future cities. Dr John Stone, SGS Graham Larcombe Award recipient Jessie Briggs, Patrick Fensham. Photo: Paul Philipson. The evening included a presentation from Dr Andrea Cook, who was awarded the Graham Treloar Fellowship for Early Career Researchers for 2017. Dr Cook shared a snapshot of her research and what the fellowship enabled her to achieve. Dr Kerry Nice was announced as the Fellowship recipient for 2018.